For the Ordinator class, see Ordinator (class). Ordinators are special guards employed by the Tribunal Temple. They are sworn to uphold both Temple law and Imperial law. Ordinators wear some of the best Medium armor, colored light-gold and blue, with masks that hide their faces. Their distinctive armor is called "Indoril armor" because many - although not all - of the Ordinators are members of House Indoril. All Ordinators are equipped with an ebony mace, a full set of Indoril armor, expensive pants, an Indoril belt, and a torch. There are four distinct subsections of Ordinators: The Order of the Watch, which is responsible for law enforcement in Temple districts; the Order of War, who fight hostile Daedra worshipers and the Sixth House; the Order of Inquisition, who try and execute "heretics", often in defiance of Imperial Law; and the Order of Doctrine and Ordination, militant scholars who study Temple writings. They are devout and staunch supporters of the Tribunal Temple who follow the reigning doctrine, and as such, are opposed to the Nerevarine Prophecies and the Dissident Priests. Ordinators are primarily stationed within the city of Vivec, where they serve as the guard. In addition, they are stationed in the Ministry of Truth, Molag Mar, and at Ghostgate. Finally, one Ordinator is stationed in Gnisis at the Temple where he keeps watch over Vivec's Ashmask. Indoril armor is sacred to the Order and only an Ordinator is permitted to wear it. If you interact with an Ordinator while wearing either an Indoril Helmet or Cuirass, they will from that point forwards indefinitely attack you on sight. This holds true even with the pieces offered as a potential reward during the investigation of the killings in Vivec. Ironically, while the Ordinators wear the aforementioned armor, none of them talk to each other. After you're named Nerevarine by the Urshilaku Ashlanders, the Ordinators might attack you on sight if your disposition with them is very low. When you meet with Archcanon Tholer Saryoni and Vivec, Ordinators will become more accepting of you. If you do enter battle with Ordinators, they are tougher opponents than the other guards, since in addition to having a better overall armor, they also cast Destruction spells. In addition to the generic "Ordinator" NPCs that serve as guards, there are named Ordinators in two classes: Ordinator and Ordinator Guard. These two classes are largely identical, except for one thing: the Ordinator Guard, instead of an Alchemy skill, has a Security skill. There is only one Ordinator Guard. Tarer Braryn - A Curate in the Office of the Watch who offended the Archmage of the Mages Guild. 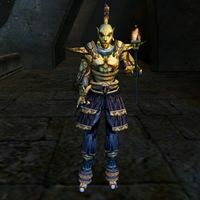 Elam Andas - A leading Ordinator in charge of investigating a set of mysterious killings in Vivec. "May our Lords be merciful!" "You have sealed your fate!" "You will pay with your blood!" "What words do you have for me, citizen?" "Greetings. I am at your service." "How may I help you citizen?" "Go on about your business." "Welcome, citizen. How may I be of assistance?" "Not now, outlander. Head on." "Let's not make this official, outlander. Move along." "Watch yourself. We'll have no trouble here." "Three Gods, One True Faith." "Go about your business. But I'm watching you." "Justice never sleeps. Almsivi watch over you." Background: "I am an Ordinator." After you have been placed on their blacklist for wearing Indoril armor and kill the attacking Ordinators, these religious guards may treat you like an innocent citizen and not pursue murderous tendencies in retribution for your sin. ? This page was last modified on 3 December 2018, at 21:25.